In observance of the International Breast Cancer Awareness Month (BCAM), the Ajman Palace Hotel and Coral Beach Resort Sharjah are partnering up to organise a health drive against one of the most curable types of cancer, which due to lack of awareness and timely treatment continues to take thousands of lives every year. The two hotels have joined hands with the Pink Caravan, a pan-UAE breast cancer initiative by Friends of Cancer Patients (FoCP), to raise awareness and funds for the charity. As part of this campaign, donation boxes have been placed at the reception areas of both the hotels, available to guests throughout the month of October. 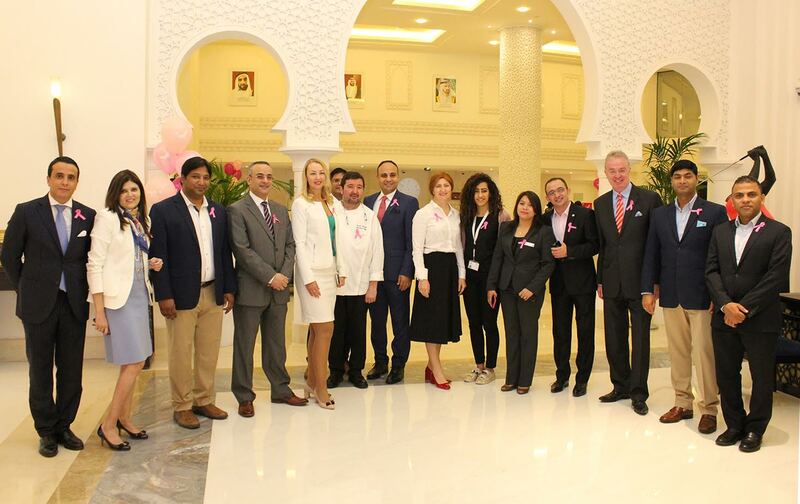 Also, hotel staff are sporting pink ribbons for the month, available for purchase by the hotels’ guests, with all proceeds to be forwarded to Pink Caravan, in bolstering their efforts in advocating breast cancer early detection across the UAE. Dr Sawsan Al Madhi, Director General of FoCP and Head of the Medical and Awareness Committee of Pink Caravan, said, “We are truly grateful to The Ajman Palace Hotel and Coral Beach Resort Sharjah for activating the month of breast cancer awareness and continuing their invaluable support towards Pink Caravan. We are keen to establish and sustain fruitful collaborations with different entities including the Hospitality Sector to expand the scope of awareness and reduce stigma associated with breast cancer in the UAE. The Pink Caravan was launched under the directives of Her Highness Sheikha Jawaher Bint Muhammad Al Qasimi, Wife of the Ruler of Sharjah, Founder and Patron of FoCP, International Ambassador of the World Cancer Declaration for Union for International Cancer Control (UICC), and International Ambassador for Childhood Cancer for UICC. Breast cancer is the most common type of cancer affecting women worldwide, accounting for 16% of all cancer types. It is notable that in UAE over 60% of breast cancer patients are diagnosed in later stages thereby decreasing their chances of survival. October is observed as International Breast Cancer Awareness Month worldwide and the campaign aims at disseminating the message that it is highly treatable and completely curable if detected in the early stages.